We specialize in the custom design, manufacturing and installation of made-to-order Curtains, from classic to contemporary or modern style Curtains, Roman Blinds , Quilted Bedspreads & other soft Furnishings i.e. Scatter Cushions, Runners etc. We aim to provide you, our customer a one-stop Curtaining & Decor facility, ensuring quality workmanship for all work, whether it’s for your Home, Office, School, Church, Any Stage Curtains or Corporate décor. We supply and install all Curtain Hardware i.e Rails, Heavy duty Brackets etc, as well as all Decorative Curtain accessories i.e. : Rods, End caps, Finials, Holdback etc. for finishing touches. We also supply and Install all types of Wooden & Venetian Blinds. Our 20 years plus experience in the field of Window treatments & Interior Decorating, combined with a flair for creativity and good taste will transform your house into a home, or your Office into a great working space, or give new life to an old Stage, when it is transformed into a real smart place to be proud of. No matter what your Interior needs are in terms of Curtains/ Blinds / Stage Curtains / Bedding ( including Quilted Bedspreads ), we will gladly assist you to in your home / Office / Corporate Environment / School / Church / Stage Curtains & Valances. You may take pictures of my curtains with pleasure, as they are beautiful and I am really enjoying them – so a BIG THANK YOU for your wonderful workmanship! Just to say that you and your team have done a great job!! I only got to see the hall yesterday and I think it looks great!! First of all a big Thank You to you and your team with all the additional help when we had our Curtains moved from the old to the new house. It was a pleasure doing the business with you once again, since you took care of all the details involved. 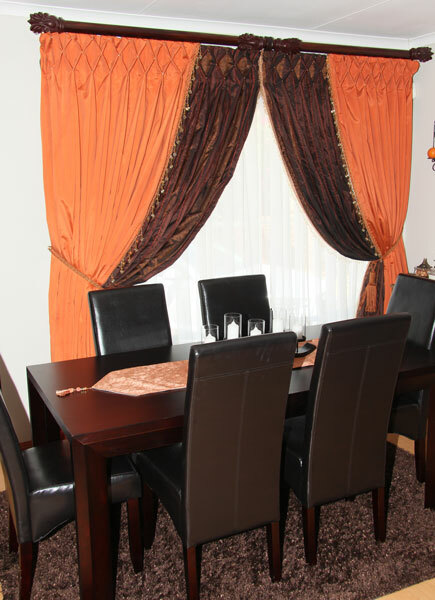 With all the alterations you had done on the existing Curtains, they look brand new after the steaming, plus your special touch with the draping of the Curtains. All the best to you, and take care.